I had a freezer full of cupcakes with no frosting. Never fear. This story does end in frosting. In fact two frostings. Both of them fruity. One naughty, one nice. And both delicious. Farmer's markets are just opening here, and the summer's bounty is starting to roll in. My fridge is beginning to burst with fruit and I've begun to find creative ways to put it to good use. Enter frosting. Both of these frostings involve the usual culprits. Butter, sugar, and flavoring of some sort. But the devil is in the details, and here it's all about the fruit. Fresh rainier cherries and juicy blackberries are the primary flavors you'll taste in every decadent bite. 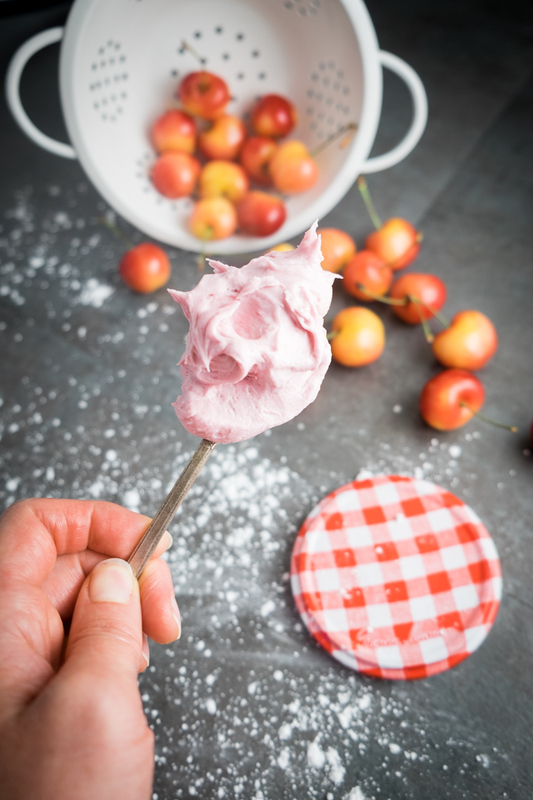 The fresh cherry frosting also features some almond extract to round out the taste profile, while the blackberry has notes of honey and elderflower liqueur. That's right. One of these spoonfuls are full of booze. I'll let you guess which one I prefer. Swirled or piped onto cupcakes, the fruit still carries the day. The fresh cherry almond frosting sits pretty on a lemon cupcake, while the boozy honey blackberry buttercream compliments a rich, chocolaty bite. Whether you choose naughty or nice, you'll never regret keeping it sweet. Until we meet again, friends, cheers to you with a cherry on top. In a stand mixer, cream butter. Slowly add sugar, then mix in extract and cherries. Adjust with milk until you reach achieved consistency, whipping 3-4 minutes. In a stand mixer, cream butter. Slowly add sugar, then mix in fruit and honey. Adjust with milk until you reach achieved consistency, whipping 3-4 minutes. Want to have your cake and eat it too? Come follow A Sweet Little Life on Facebook.